Good morning! If you haven’t already eaten breakfast, make these scones! They are very delicious and very light. I had some troubles making them, but really they are very easy. I have learned that fresh raspberries are very hard to work with so use at your own discretion. Weight Watcher’s folks, this comes right from the Weight Watcher’s website and are 3 points plus! Definitely a perfect treat for 3 points. Recipe below! 2. In a large bowl, whisk together flour, sugar, baking powder, and salt. Mix in butter until mixture is size of fine crumbs. Stir in buttermilk, then berries. 3. On a prepared baking sheet, shape dough into two 7 inch circles. Cut each into 6 wedges; oat with butter-flavored cooking spray. 4. Bake until cooked through and golden, about 20 minutes. Yields one wedge per serving. I couldn’t make the dough into 2 circles, and frankly, I didn’t even try. I rolled mine into a log and cut 12 pieces, so mine came out round. Pretty much the same thing right? I also missed the spray with butter flavored cooking spray step. Mine tasted good without that so I would say if you don’t have that in your house, don’t worry about it! Like I said before, I tried to use fresh raspberries and blueberries, but the raspberries were too hard to work with so I had to throw out that dough and start over. 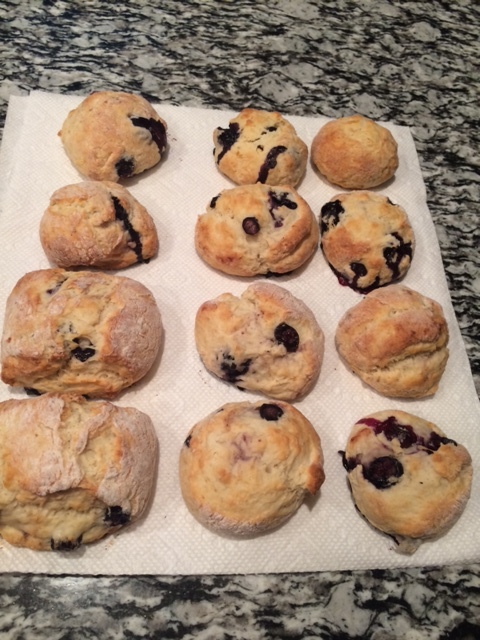 My second batch, which is above, is just fresh blueberries and a tiny bit of lemon juice and some lemon zest. They taste very good, I am happy with how the lemon flavor came out in them. The dough is hard to work with when mixing in the berries, so be careful. In my second attempt, I mixed in the berries at the same time I was mixing in the buttermilk so it would be easier to mix. I also mixed it with my hands once the buttermilk became mixed in. There are some pieces that have more blueberries than others, but what can you do!